Mermaid lemonade is a super refreshing anti-inflammatory lemonade with a vibrant aqua color thanks to blue spirulina. There’s nothing more refreshing than a cold glass of lemonade on a hot day, but what if that lemonade was actually good for you too? With this blue mermaid lemonade it can be! No more feeling guilty for cooling yourself off with some delicious lemonade. 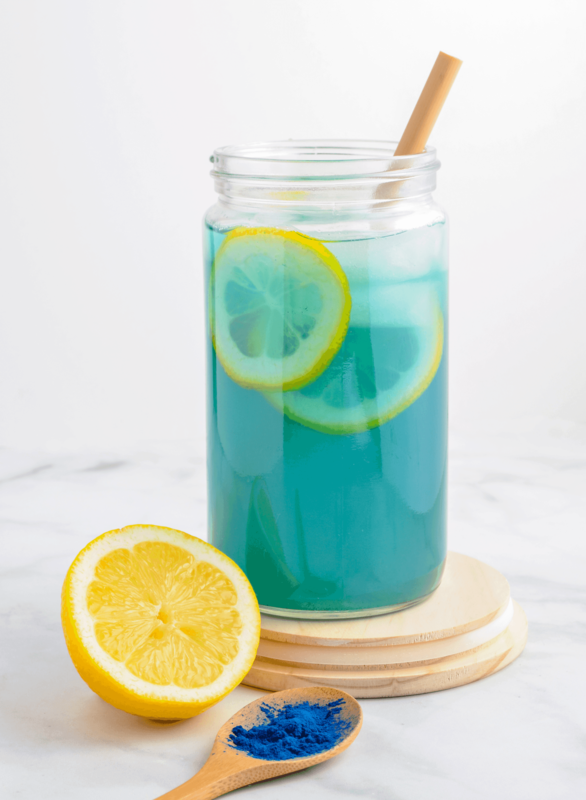 This blue lemonade gets its beautiful color from Blue Majik, a natural blue spirulina extract with powerful anti-inflammatory properties and tons of antioxidants! It’s also sweetened naturally instead of using processed sugar (I used raw agave nectar, but feel free to use your favorite natural sweetener). Plus this healthy drink might even be easier to make than this 5-minute blender carrot juice recipe! Ok so what is blue spirulina, and why does it make this lemonade good for you? Spirulina is a blue-green algae, and is known for being one of the most nutritionally dense and complete food sources on the planet. It’s a true “superfood”. It is also rich in antioxidants and anti-inflammatory compounds, primarily due to the pigment-protein called phycocyanin. Phycocyanin is also responsible for the blue color in spirulina. “Blue spirulina” is typically an extract of just the phycocyanin. So why would someone want to consume just the phycocynanin from spirulina, and not the spirulina itself (besides the beautiful blue color obviously)? For starters, spirulina algae can have an undesirable “fishy” taste which makes it hard to add to foods or drinks. Phycocyanin on the other hand has no noticeable flavor. But the main reason to consume phycocyanin on its own is to get higher dosages of it than you could get from just spirulina. Wash the lemons and cut them in half. Roll the lemons with your hands on a hard surface to help them release their juice. Using a citrus press or your hands, squeeze the lemon juice into a bowl, removing any seeds. You should get about 1 cup of fresh lemon juice. Whisk together the agave nectar and lemon juice until thoroughly combined. In a large pitcher, combine 4 cups of water, agave/lemon juice, and blue spirulina, and pinch of salt. Stir until well combined and the spirulina powder has dissolved. Fresh Tip: The key to a good lemonade is the ratio of water, sweetener, and lemon juice. You can make any sized batch, just stick to 4 cups water to 1 cup fresh lemon juice, to 1 cup sugar (or its equivalent in other sweeteners). Mermaid lemonade is seriously easy to make and it’s so refreshing! I’m definitely going to be drinking this all summer, along with this hydrating aloe vera juice. I’ve also included this spirulina lemonade as one of my DIY juice cleanse recipes. Most juice cleanses have a healthy lemonade as one of the juices, and this recipe takes that to the next level! I love doing a juice cleanse every time I feel like my eating habits are getting unhealthy. A cleanse gets me back on track and completely resets my unhealthy cravings. Here’s a guide on how to do a juice cleanse the right way, and why you might want to give one a try. I don’t normally recommend specific brands, but when it comes to spirulina, I definitely recommend E3Live. Their spirulina comes from Lake Klamath in Oregon and is considered to be the most potent and bioavailable spirulina. Want more healthy juices? Check out these turmeric ginger wellness shots for more potent anti-inflammatory goodness! Did you try this recipe? Let me know what you think in the comments below, and be sure to leave a rating. Wash the lemons and cut them in half. Using a citrus press or your hands, squeeze the lemon juice into a bowl, removing any seeds. You should get about 1 cup of fresh lemon juice. Whisk together the agave nectar with the lemon juice until thoroughly combined. In a large pitcher, combine the water, agave/lemon juice, blue spirulina, and a pinch of salt. Stir until well combined and the spirulina powder has dissolved. Refrigerate or pour over ice and enjoy!